Enjoy your stay in a comfortable and spacious suite. Feel at home with lots of storage space, and enjoy amenities including an innovative Working Wall, free WiFi, work desk with ergonomic chair and Serta Suite Dreams bed. Prepare meals in your kitchen equipped with a dishwasher, microwave and refrigerator. Select a one-bedroom suite for extra space and separate living and sleeping areas. Enjoy free breakfast daily at the Inspired Table™, and buy snacks and sundries at 24/7 Home2 MKT®. Socialize in the Oasis and enjoy family time in the outdoor patio with fire pits and grills. 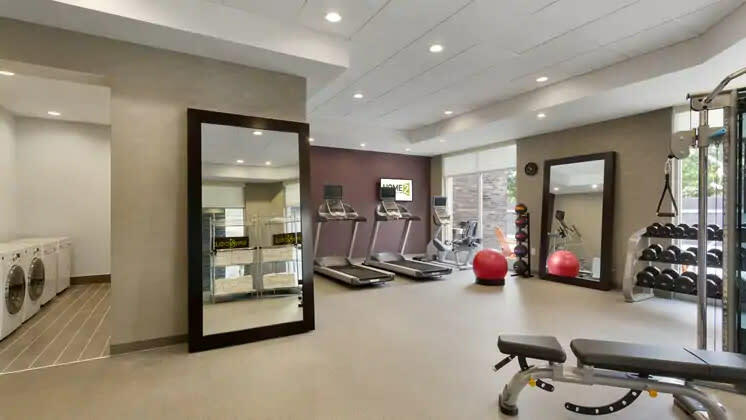 This extended stay hotel in downtown Greenville offers an outdoor saline pool and a Spin2Cycle fitness room with a combined laundry facility, to help you keep fit during your stay.